Markley Boyer, The Mannahatta Project, 2009, digital rendering, Wildlife Conservation Society, New York. To problematize the social definition of Nature and how it is a hindrance on accepting the state of new Nature; the “Synthetic.” To synthesize that as Nature enters the realm of production it gains value, both economically and practicality. Cite as: Estrada, Leif. (2013). "Death of the Natural, and Emergence of the Synthetic." Unpublished Manuscript. Graduate School of Design, Harvard University, Cambridge, MA. Fig. 1: Markley Boyer, The Mannahatta Project, 2009, digital rendering, Wildlife Conservation Society, New York. Fig. 2: (Author unknown), Champs-Elysées, (date unknown), photograph, http://parisapartmentsbynumbers.files.wordpress.com/2013/07/image1.jpg. Fig. 3: Matthew Coolidge, Excavation, Irwindale, 2008, digital mapping, Actar, Barcelona. One of the town’s largest pit, Durbin, is operated by Vulcan Materials, which has transformed the landscape into engineered plateaus with the continued land mining economy. Overall, land-alteration economy generates an annual estimate of $2.5 billion. This “synthetic” reshaping of the landscape seems to be of a natural phenomenon to its inhabitants as it generates economic value for the city. Alternative capping solutions included turning them into dumps in order to landfill them. This, however, have discouraged by the city as it worries that Iriwndale might become the garbage dump of the city of Los Angeles. Besides bringing them back up to grade, other solutions have embraced the re-appropriation of these voided landscapes into dam basins. The modification of the landscape through the productive economic means of aggregate mining has changed the “natural” ecology of the town, producing a new “synthetic” economic-generating landscape. This however presents an interesting second Nature aura to its inhabitants, which doesn’t cause alienation and nostalgia with the previous “natural” state. In a way, the new “synthetic” engineered landscape of Irwindale has become its new Nature, and the productive economy has helped people with its transition. The Los Angeles River is the epitome of how an urban river produces the new nature of the synthetic through the dialectic of infrastructure and urbanism that are overlooked because of its “eye-sore” aesthetic value. Historically, the LA River meandered across the floodplain, where its watershed boundary constantly redefined itself across the Lost Angeles landscape (Fig. 4). The hybrid of its “nature” and its infrastructural value produces the new nature of the “synthetic,” with an “infrastructural ecology [that is] opportunistic and emergent, one that lives off human excess with many of its values and functions unknown or misunderstood.” (Fletcher 2008, 38) Understanding the complex ecological processes of the river is important in developing appreciation and new narratives of the river’s function as not only as an urban hydrologic infrastructure but also as an ecologic incubator supporting new eco-systems. Fig. 4: David Fletcher, LA River Watershed, 2008, digital mapping, Actar, Barcelona. Under the collaboration of the United States Army Corps of Engineers, the County Flood Control District and the Works Progress Administration, the river was channelized of its tributaries and lined with concrete in order to “prevent” further “degradation” of its ecological edges and prevent flooding. The rivers morphological hydrology condition was causing “destruction on the landscape” damaging the local economies that were settled along its edges. (Fig. 5) Clearly, the commodified value was favored over its ecological benefits, with the solutioned “taming” of the river. The channeling project was conducted in order to redirect the flow of water from the valley to the ocean as quickly as possible and to prevent further overflow and flooding. As a result however, the eco-systems that existed along its edges, both flora and fauna dissipated in search for new systems to support it. Over time, the river ceased to exist as such, more so it became a jurisdictional matrix of boundaries of politics delineating private and public landownership. The City of Los Angeles, who owns the river’s flows with its boundary, the County of Los Angeles, who channels the “right of way” to convey flow and the Army Corps, who maintain the river’s operations are but a team who are only interested with its infrastructural benefits being an engineered hydrology and nothing else. This technocratic control of the river causes the simplification of the river’s complex life. The elements that flow in the river are overlooked and taken for granted. Other successive ecologies that now thrive in this “synthetic” landscape are bat colonies that have territorialized the underside of bridges. They have become part of the eco-system and have kept the mosquito population low as they feed on these insects. Parrot colonies, which have escaped private homes, have also relocated to the LA River contributing to the thriving of this new ecology based upon the ignored synthetic surface of the river. The general point of view that “native is good” and that “exotic is bad” can be correlated with the debate between the environmentalists and industrialists posited by Evernden. The same goes for the LA River, where its engineered concrete aesthetic is seen as an eyesore, therefore it’s bad. Many ecologists, such as Peter Del Tredici would argue against the return back to the “natural” state of the river from the now thriving asphalt ecology. In many ways, this would pose a threat to the urban ecology of the “synthetic” that have emerged and have formed in response to the river’s channelization. Many have also advocated for the removal of the new exotic species of the river and replanting the once-existing historical vegetation that have existed on the water’s thresholds and watershed. This narrow agenda does not take into account the new species that are now dependent on the river’s current eco-system. Reverting back to the river’s “historical” state would yet create a new “synthetic,” however over time would naturalize itself [again] in response to its context through adaptability. These successive emergent ecologies now serve as green infrastructures, which help cleanse and process nutrients preventing erosion, such as trash breaking down to become part of the riparian eco-system, and provide a habitat which can begin to survive autonomously from human agency. It is, however, important to point out that invasive species can indeed be damaging, but a eugenic response for the benefit of the “natural” fails to see ecological contribution of the exotic and “synthetic,” which performs with significant results for the eco-system. Preservationists’ advocacy for the eradication of the exotics and an assumption that native vegetation would once again return to dominance in the LA River to dominance is nearly impossible. As the soil and hydrologic conditions have changed and evolved radically, the “native vegetation” would require care and maintenance before it could adapt and survive on its own. In contrast with the “synthetic” nature of the voided landscape of Irwindale, consciously created as a means of a productive economic land mine for the city, the ecological transformation of the LA River, however, was by accident, therefore the unanticipated growth of new species are deemed to be invasive and unproductive. The contemporary importance of “synthetic” ecologies that Nature produces in dialectic with production should be realized and that its “dynamic systemic change” within the landscape and the current temporal eco-system is “related to the phenomena of adaptability, resilience and flexibility.” (Reed & Lister 2013, 1) Central to understanding synthetic ecologies is the concept of ecological succession, the changes brought upon by the disturbance of our production of new technologies to fulfill our needs, sometimes due to our materialistic desires. However, natural disasters such as fire, flood, earthquake and so on are integral parts to the processes of new ecological emergence and evolution to a more “synthetic” state. The notion of static and stable Nature, for instance, that predates the built environment of cities, is impossible and somewhat of a fiction. Along with natural phenomena are non-natural disturbances, which are important variables in the equation of production of the new Nature of “synthetic ecologies,” including urbanization, the effects of global warming, which are ecologically caused by production. Therefore, the dichotomy between the “native and the exotic” or the debate of the “environmentalists and industrialists” are irrelevant as both are integral agents to Nature’s growth. The assemblages and creation of new Nature of the “synthetic” should not be mistaken as the cause of environmental degradation when it is the result of ecological evolution. Evernden, Lorne Leslie Neil. 1992. The Social Creation of Nature. Baltimore: Johns Hopkins University Press. Haraway, Donna Jeanne. 1991. Simians, Cyborgs, and Women: The Reinvention of Nature. New York: Routledge. Negrotti, Massimo. 1999. Theory of the Artificial: Virtual Replications and the Revenge of Reality. Exeter, England: Intellect. Reed, Chris, and Nina-Marie Lister. Projective Ecologies. 2013. Barcelona: Actar. Sanderson, Eric W., and Conservation Society Wildlife. 2009. Mannahatta: A Natural History of New York City. New York: Abrams. Smith, Neil. 1984. Uneven development: Nature, capital, and the production of space. New York, NY: B. Blackwell. Varnelis, Kazys. 2008. The Infrastructural City: Networked Ecologies in Los Angeles. Barcelona: Actar; The Los Angeles Forum for Architecture and Urban Design; The Network Architecture Lab, Graduate School of Architecture, Planning and Preservation, Columbia University. Benjamin, Walter. 1936. “The Work of Art in the Age of Mechanical Reproduction.” Limited Reprint, London: Penguin Books, 2008. Coolidge, Matthew. 2008. “Margins in our Midst: Gravel” in The Infrastructural City: Networked Ecologies in Los Angeles. Barcelona: Actar; The Los Angeles Forum for Architecture and Urban Design; The Network Architecture Lab, Graduate School of Architecture, Planning and Preservation, Columbia University. Del Tredici, Peter. 2010. “Spontaneous Urban Vegetation: Reflections of Change in a Globalized World” in Nature and Culture 5. Oxford: Berghahn Journals. Fletcher, David. 2008. “Flood Control Freakology: Los Angeles River Watershed” in The Infrastructural City: Networked Ecologies in Los Angeles. Barcelona: Actar; The Los Angeles Forum for Architecture and Urban Design; The Network Architecture Lab, Graduate School of Architecture, Planning and Preservation, Columbia University. Marx, Karl, and Friedrich Engels. 1845. “Part I: Feuerbach. Opposition of the Materials and Idealist Outlook” in The German Ideology, Parts I & III,. Vol. 6. Reprint, New York: International Publishers, 1947. Pícon, Antoine. 2000. “Anxious Landscapes: From the Ruin to Rust” in Gray Room 01. Cambridge: MIT Press. Ryan Lynch. Harvard Yard Trees. 2007 [cited Nov. 24 2013]. Available from http://www.crimsoncanopy.com/harvardyard/elm.html. Fig. 1. Boyer, Markley. The Mannahatta Project. 2009, Digital rendering. Wildlife Conservation Society. New York. Fig. 2. --. Champs-Elysées. Photography. Available from: Paris Apartments by Numbers, http://parisapartmentsbynumbers.files.wordpress.com/2013/07/image1.-jpg (accessed December 17. 2013). Fig. 5. --. 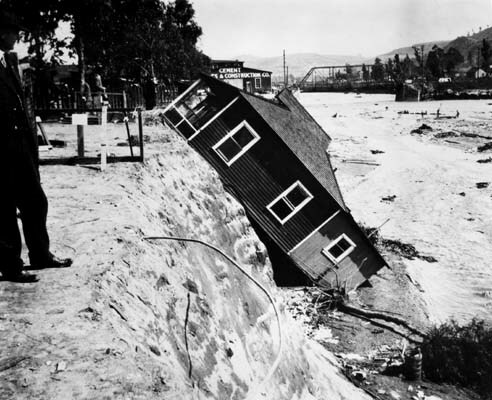 An earlier conception of the 'freakology' of the L.A. River as experienced in 1914… Photography. 1914. Available from: Free Association Design through the Los Angeles Public Library Photo Archives, http://freeassociationdesign.files.wordpress.com/2010/05/flood_1914.jpg (accessed December 17. 2013). Fig. 6. FOVICKS, Friends of Vast Industrial Kafka-esque Structures. Untitled, Photography. 2010. Available from: Mammoth, http://m.ammoth.us/blog/wp-content/uploads/2010/05/la-river_2.jpg (accessed December 17. 2013). Charles Waldheim, John E. Irving Professor of Landscape Architecture | Harvard University - Graduate School of Design; for the advise and guidance in developing the theoretical frame of the paper. Chris Reed, Co-Director of the Master of Landscape Architecture in Urban Design Degree Program Professor in Practice of Landscape Architecture | Harvard University - Graduate School of Design; for advising in writing this paper, which was the initial probe of my Master's thesis. David Fletcher, Associate Professor of Architecture | California College of the Arts; for the inspiration in looking into the landscape of "otherness"